Perone populated with a swarm. Posted: Tue May 06, 2014 3:58 pm Post subject: Perone populated with a swarm. THis post starts over at Horizontal top bars with 'Making a split'. THings developed from there to a swarm and the swarm being housed in My Perone so it was more appropriate to note it here. Following my split top bar hive swarming regardless i was in the lucky position of them resting on the wall 5' up right by my house window. Following the cut out they were shaken off the frame and climber into a plastic box which i placed a lid over. The Perone hive was then stripped down to the brood box. I had pre waxed the brood bars last year with wax so i was ready to go. Bees dumped in and top bar panel placed over. I placed the rest of the hive assembled next to me on a garden table so i could quickly place it all back on. It is heavy so i would suggest grabbing a helper. 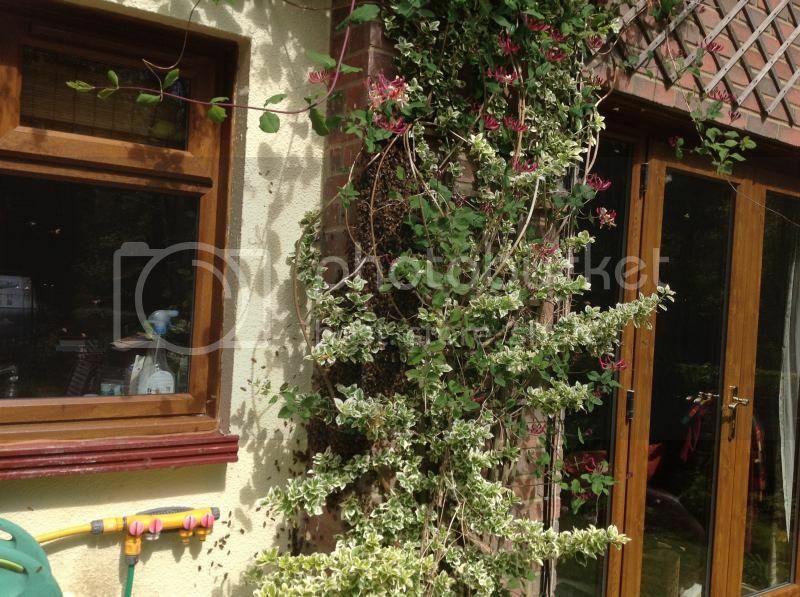 Now, a few hours on and there are bees at both entrances fanning and bees in and out. To me it looks good. Exciting stuff. The pictures are excellent. I'm still waiting for a swarm from the top bar hives here for my perone. Have you gone for full size i.e brood + 3 supers? 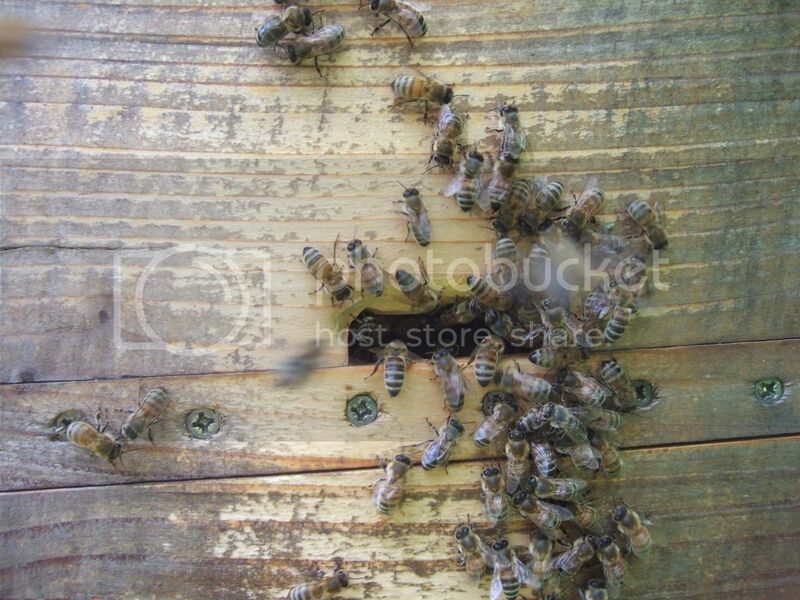 The weather is so much better this year so hopefully they will build up fast in your hive. 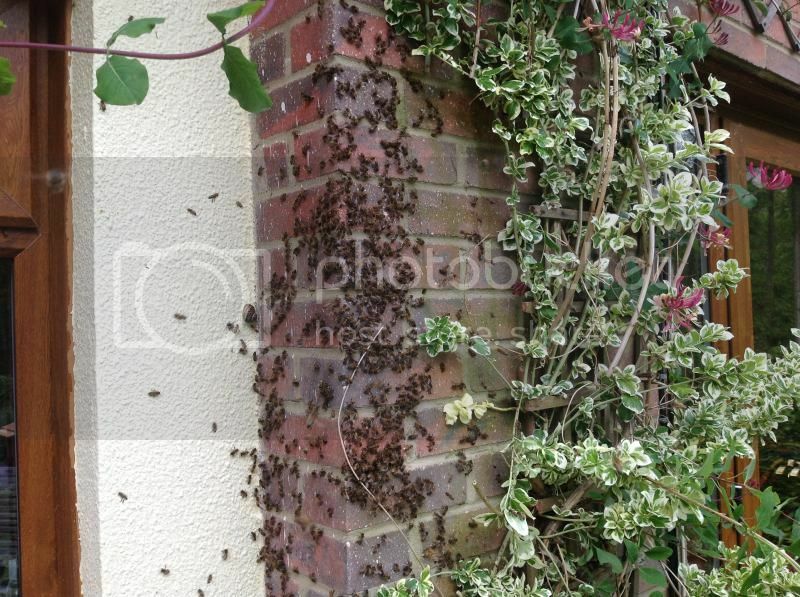 Must have been quite a job getting the bees off the wall! Yes, full size. All supers placed on top. I read loads last year and decided this was something i wanted to try. It is very exciting catching them and actually housing them so i have fingers crossed that they don't abscond or fail. Last year i had a swarm from the top bar land in a tree opposite my front door but the position was just a bit too precarious for me to collect them. I watched them sit there for a week rain and shine before they moved on. Now for the waiting game. Last year I shook a swarm into the Perone and have basically ignored it to let them get on with what they get on with. As I had not put a quilt in to the top I was concerned that I might not be able to strip the hive down and that the bees, if in the top super may have glued it all up with propolis so I thought, 'time to have a nose'. Suprisingly the roof came straight off. this was good news as I could have a look in. The uppermost super had no build in it at all. I then used a steel guitar string (garrotte style) to cut through any propolis and comb build from below this second box and the top of the third. I do not see how else you would separate these. It worked a treat with no issues. In the picture you can see where the wire has cut through the wax where it was attached to the top of the bars of the third box by the bright honey. The second super down was full of brood and capped honey. The capped honey was fully along the outer three bars each side. The third super (from looking down, I did not remove this one) looks much the same. I do not know what is going on in the main box and will have to get an endoscope to have a nose. All looks excellent though with masses of activity in and around the top entrance each and every day and about 10 percent of that activity reflected in the lower entrance. 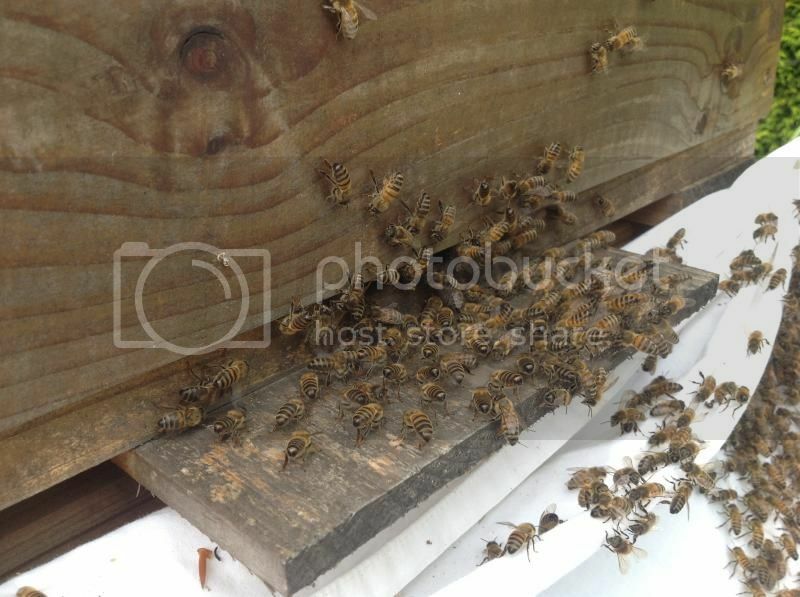 I lost a Warre hive this winter gone due to condensation and was concerned here too. I do believe though that the dual entrance of the Perone was it's saviour from this particular issue. Next time I look will be towards September so will update then. One question - did you need to use any smoke as you took the hive apart ? Ah smoke.......well I do not use smoke as we usually do the hives first thing in the morning and find the bees are no problem. This time we had the smoker lit and handy.....and forgot to use it. Plenty of bees flying about from this super but no real problem. I will wear thicker trousers next time there were a couple of stings caught in the fabric of the trousers that scratched me and luckily I just ended up with minor 'scratch stings'. (effects wear off after a couple hours). Hi - that must be a fantastically satisfying result for your first year in the Perone ! I populated 2 TBHs last yr, one with a prime swarm and another with a split and a 2nd swarm. All 3 colonies have come through fine and the original prime swarm is just about now to swarm out of its almost full TBH. So to see your Perone with 2 full supers is pretty impressive - have you any idea how much they filled out the broodbox prior to moving into the supers ? Do you think that's a reasonable thought process, or if you did yours again would you do it exactly the same as before ? Also were your 2 entrances at the very top and bottom of the brood chamber, and open all year ? Glad your Top Bar Hives are doing well, it is stunning how quickly they build. I have no idea yet about the brood box as I have not looked, apart from the one super being lifted I have not disturbed anything else. I placed it all out fully to allow the bees to assess the size and left them to it. I am not sure that reducing or adapting will work, the size, from what I have been able to read, is an important fact in the design. I would do the same again with mine. The two entrances are at the top and bottom of the brood box. Interestingly both have been quite well adapted by the bees. The bees at this moment are busy enlarging the bottom entrance. Camera battery is flat, I will post a picture soon. I agree with the above...when he designed the hive it was to be populated full size so the measuring the bees did would account for the whole space and not just part of it. Looks like in your case it is working...hooray! Have provided a swarm for Perone on organic farm near Cambridge last Sunday. Will see how they are doing tomorrow - looking at entrance, not lifting roof at all yet. 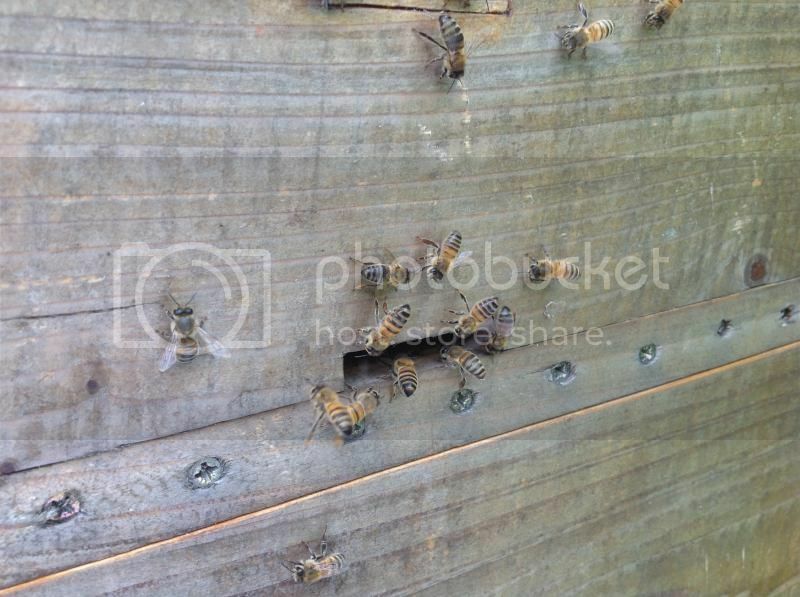 Photos of the bees changing the entrances to how they want them! One of my Japanese hives also has a "top" ( actually 25 cm from the top ) and "bottom" ( again, 25 cm from the bottom ) entrance, each of them about an inch in diameter. In late autumn/early winter, they block the bottom entrance except for a single bee's width. In the spring, they open it up again. They have also twisted the comb round so that it forms a sort of curtain in front of the "top" entrance, effectively making it a "warm" entrance, even though right at the very top the comb is running diagonally. Hi - If you find the time I'd be interested in reading an update on the perone's progress over this summer. Problems/swarms/honey/outlook ? 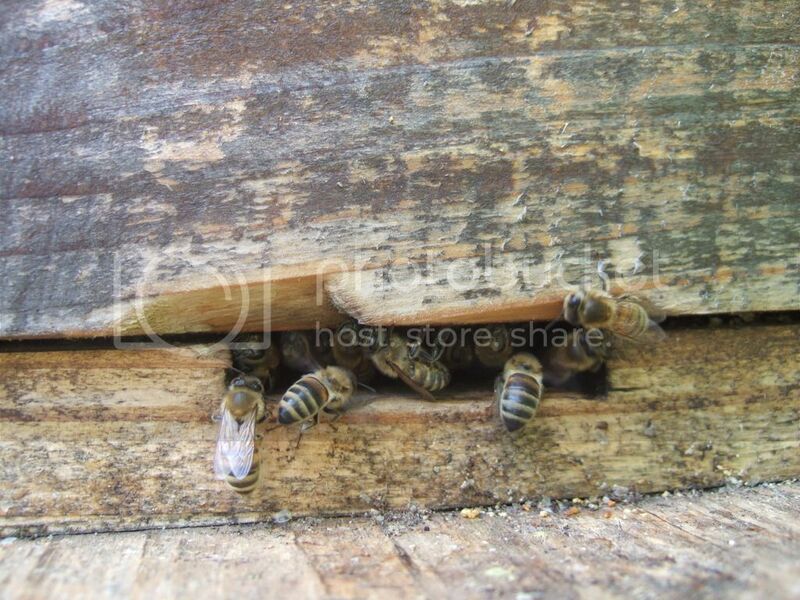 Any chance of an update on your Perone hive please? 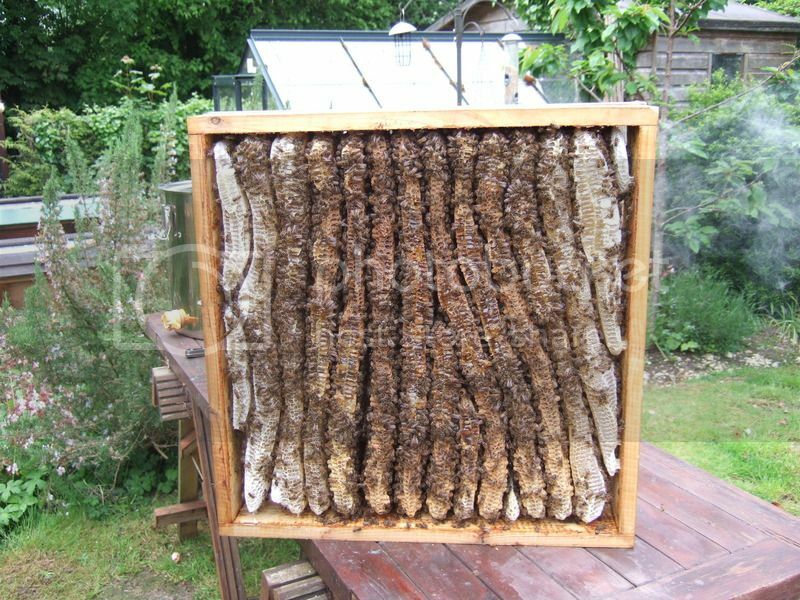 I'm very interested in this type of hive. Will this be my first perone year? Any news on this by the one that started to yuse them... any production yet? I could not populate mine this year: no swarming the weather was just too bad. I also have seen on a french discussion that they did not do it... and are now availlable for free for the one that want them.